Among the many wonderful products that typify the sun-soaked Provence region of southern France are the printed cotton fabrics that are used to make household linens and clothing -- textiles adored by Parisians seeking to add a touch of summery, folksy charm to their otherwise ultrasophisticated modes de vie. I dare not argue with Parisians on matters of style and neither should you--provençal prints are wonderful to wear when the days turn warm and the sun shines bright. There's a brilliant history of these distinctive fabrics here. 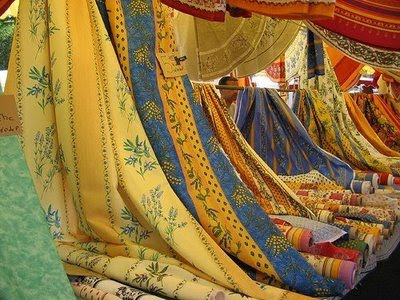 While fine vintage examples are somewhat infrequent due to their regional origins, garments from Les Olivades and Souleiado are the best known of the genre. 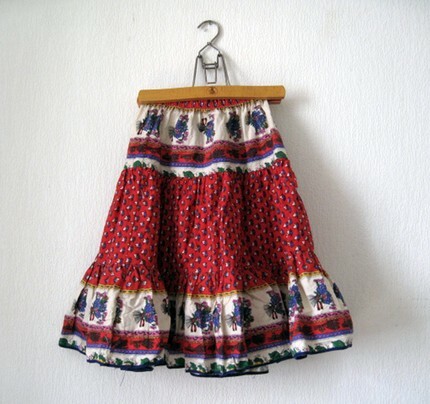 Or, if you're seeking online, simply type in "provencal print" and you may turn up something as cute as this skirt from Etsy . . .
By the way, souleiado translates from the craggy Provençal dialect to mean "rays of the sun breaking through the clouds after the rain." Isn't that beautiful? You can practically smell the lavender . . . Fascinating history - love the name and the naturally vibrant colours too. I love these prints for summer...but they make me long for a house in the South of France! is there a list of fabric prints per region? I am going to nice and marseile in july?